This news item was posted in Breaking News, Pakistani News category and has 2 Comments so far . Google translation, a tool to translate from one language to 57 another languages, has added Urdu in the list. Meaning that, now you can translate 57 languages into Urdu and from Urdu to 57 well known languages of the world. This remarkable achievement will greatly help in localizing the content by presenting foreign language websites in Urdu language through Google’s web page translation tools. At this moment, we must not forget PakTranslations.com that served for long, as only Urdu language translation tool available on web. But this move from Google is going to hamper PakTranslations, by large, particularly, when it comes to results. Just to add, Google Translation allows users to upload documents and get them translated with a single click. 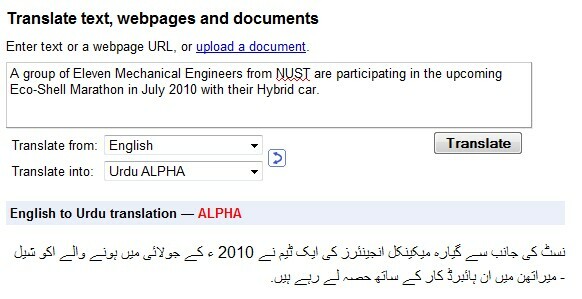 Also you can use Google Translate for Urdu to any other Language dictionary. About the quality of translation, given that in ALPHA version, results are amazing good, but not the perfect. Let’s expect further enhancements with time. That is good news. We need to shift it from alpha to final, follow me for this.